The NOOK Tablet AC adapter is a small cube that plugs into a wall outlet or power strip. 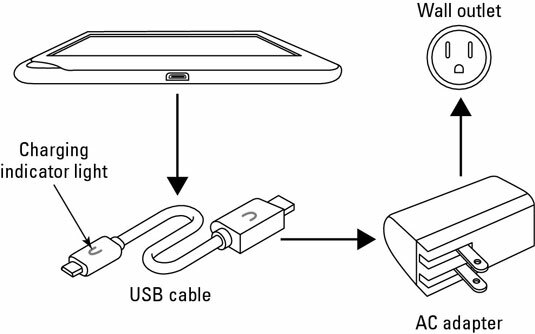 To use it, you also need to attach the microUSB cable to the cube at one end and to your tablet at the other. You can’t use just any old AC adapter and cable to recharge your NOOK Tablet; it has a pretty strong battery that makes fairly high demands on adapters and wiring. Specifically, don’t use power supplies from the original NOOK or the NOOK Simple Touch. You can also buy a car charger for your NOOK Tablet; check the accessories page or your local Barnes & Noble store for availability. Please, though, don’t try to read a book while driving down I-95.